Japchae is a stir-fried dish that combines sweet vermicelli noodles made from the starch of a white sweet potato, thinly slices of beef, and various vegetables. It is usually prepared with carrots, green onion, spinach, shiitake mushrooms and green peppers. Beef may be added as an option but may be left out to be served as a vegetarian dish. The noodles are gray when raw and turn almost translucent when cooked (thus given its popular nickname, glass noodles). When cooked correctly, they retain a chewy texture. 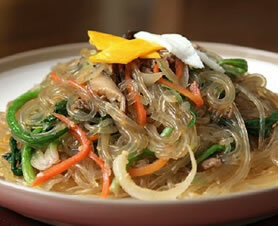 Japchae is often served at Korean parties and during special occasions as the main dish or as a side dish. It can be added to a bed of rice and mixed together to make japchaebop, bop meaning rice. Soak mushrooms in water for 15 minutes. Cut off stems then cut the caps into thin strips. Cut beef into thin strips and marinate it with the mushrooms in a seasoning of: soy sauce, sugar, minced garlic, sesame seed oil, chopped green onions, and a pinch of ground pepper. Cut carrots and onion into thin strips (julienne). Cook spinach in boiling water for about two minutes. Cool spinach in running water. Squeeze the water out of the spinach. Season the spinach slightly with salt and sesame seed oil. Batter and fry the egg in a pan with a pinch of salt. Once cooked and cooled, cut the egg into thin slices. When beef is cooked, add carrot, onion, spinach, and noodles and stir-fry.